Butts County Commissioners approved the concept plan presented by County staff on Monday to add an approximately 11,000 square foot expansion to the existing Administration Building and to reconfigure portions of the existing building so as to bring all of the court systems of Butts County to the location on 625 W. Third Street. Once completed, it will be the first time in decades that the majority of County services will be housed on one campus. More importantly, the project has already received voter approval, in the form of the Special Purpose Local Option Sales Tax, which voters re-approved just over 14 months ago at 84%, with this and two other projects at the top of the ballot. 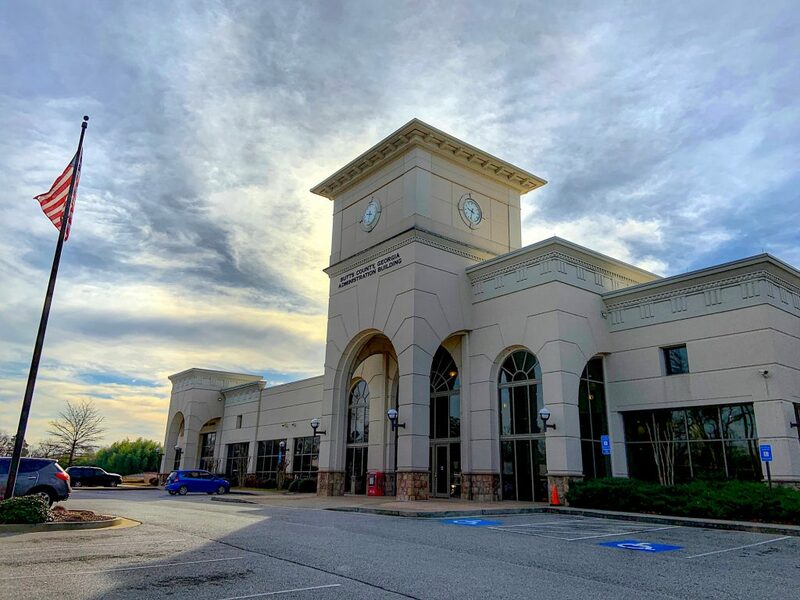 “Basically, this conversation had been going on for years but began to gain new traction when the Grand Jury emphatically said that it was time for Butts County to build a new courthouse” said county staff on Wednesday. “We couldn’t afford to build a completely new courthouse but it got our board and staff working on how this could be accomplished for far less than the estimated $12 million dollar price tag that a totally new courthouse would have cost”. The solution, arrived at after many months of research, surveys, assessments and meetings with judicial stakeholders, was to leverage assets which the County already owned, and maximize what could be done with them. The design/build team of CT Darnell Construction and Clark Patterson Lee architects, after having met with the judges and clerks of the Superior Court, Probate Court, Magistrate Court, Juvenile Court and support offices, determined that the needs of today’s court would require 22k square feet of space, including multiple courtrooms and office space. The west wing of the County Administration Building, which included a large auditorium, already had 23k square feet, as well as having twice the ceiling height availability of the existing east wing of the building, another requirement of courts. Building brand new court space also costs nearly twice as much per square foot as building standard office space does, and reconfiguration costs are even less, so the logical solution was to reconfigure the west wing to accommodate the courts and to build new space to move the offices from the west wing into the new addition. Build an approximately 11k square foot addition on the east side of the existing administration building, using part of the vacant lot already owned by the County. Inside this addition, relocate the offices of the Tax Assessors, Tax Commissioner, Board of Elections, Board of Commissioners, Planning and Development, and Administration, all of whom would vacate the current west wing of the building. The existing east wing would remain mostly as it is, continuing to house the District Attorney and E-911, while also using the offices of the existing Visitor Center/Chamber/Development Authority space for court services. What is currently considered the east wing would then become part of the west wing, once the new east wing is constructed. Once all existing offices are out of the west wing, reconfigure that wing to house the Probate Court, Magistrate Court, Superior Court, Juvenile Court, Superior Court Clerk’s Office and the Juvenile Court Clerk’s Office, including courtrooms of different sizes. Configure one of these courtrooms as a multipurpose room to allow it to work for both courts as well as Commission Meetings, Planning Commission meetings and related public meetings that are currently held at the Administration Building during evening hours. Once all court offices are relocated to their new home, reassign the space previously occupied by those offices for other purposes. Proposed examples of this would be to use the offices currently occupied by the Clerk of Superior Court across from the courthouse for critical archive and records storage space, which makes sense due to it already having been purpose built for that kind of use. The building already has a built in fire suppression systems, secure vaults, climate and humidity control systems, and security systems already in place. This makes it an ideal location for the storage of historical documents and files that must be kept safe but which are not always needed on a daily basis. Space in the existing Historic Courthouse has already been allocated for future use by the Chamber of Commerce, Visitors Center, Industrial Development Authority and other civic uses. The Magistrate Court would likely keep a courtroom at the jail for holding hearings on the premises, but other office space vacated by them could potentially be repurposed for the Public Defender’s Office. The best thing about this project is that it will accomplish the needs and objectives of providing modern, efficient court space for less than half of what it would cost just to build a new courthouse alone, and it will get all of our major administrative and judicial functions under one roof, which makes it much more convenient for the public. The new SPLOST, which began this year, allocates $4 million dollars for new building construction and up to $3 million for renovations and technology. The concept plan approved would be accomplished for $5.8 million dollars, saving millions over original estimates. Oftentimes the public has to go to multiple locations to deal with certain transactions and this will be much easier in the future. Funding for the entire project has already been approved by the voters and sanctioned by the Board of Commissioners, and all of it is coming from the penny sales tax, of which 54% is paid by people who don’t even live in Butts County. When the current Administration Building was developed in 2006, it took six county offices that were in different locations around town and put them all under one roof, creating greater efficiencies for the public and the government, but the County has never lost sight of the ultimate goal, which was to get the court services together with them in one location. The concept plan will accomplish bringing four courts and two offices from two other buildings and adding those six to the six already here, resulting in twelve separate agencies housed in one location. Relocating the court services will free up critical downtown parking while leveraging the Historic Courthouse to be used in line with downtown and countywide economic and business development opportunities. Now that the concept plan has been approved, the architects and construction company can finalize the design of the new wing and reconfigured existing wing so that construction can hopefully begin in the next few months. The County is excited about the opportunities this will create once it is completed for enhancing the efficiency of County services and the ease of use by the public for accessing those services.